Enter the email address on your FWN Member record to take advantage of FWN Member rates. PLEASE NOTE: The member rate will be grayed out if your membership is lapsed, overdue or if you are not a FWN Member. If you joined FWN to take advantage of member rates, please allow 24-48 hours for your membership to be approved and full dues payment to be received before we can activate your membership. This is the order page to purchase any of the FWN's book on Filipina women leadership if you wish to order via FWN. 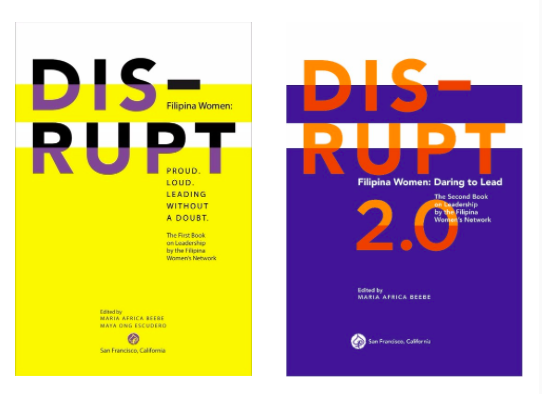 You may also go to https://smile.amazon.com, choose "Foundation for Filipina Women's Network" as your favorite charity then go to on.ffwn.org/DISRUPT to order printed copies and the Kindle e-book versions. DISRUPT 1.0. Filipina Women: Proud. Loud. Leading Without A Doubt. Book cover designed by Lucille Tenazas.